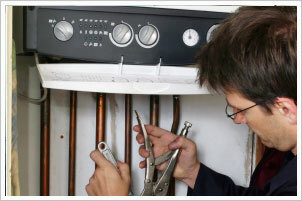 We offer a full range of heating services, from minor repairs to complete installations and servicing. Fuel for a heating system is a major expense in any home and we specialise in advising on the most efficient boilers and systems to suit our customers’ needs. Older boilers can be very inefficient, in some cases converting only 60% of your costly fuel into usable heat. A new condensing boiler from Upfields Plumbing and Heating Contractors can raise this figure to 93%. All Upfields Plumbing and Heating Contractors accredited engineers are Gas Safe Registered and we have a dedicated team of service managers, ensuring the highest possible standard of work. As with everything we do, you the customer comes first and we aim to carry out your work as speedily as possible, with the minimum of inconvenience to you.